A empresa responsável pela atividade a desenvolveu de forma segura e eficiente. Os guias apresentaram total domínio sobre a história da cidade, acrescentando aos participantes novos conhecimentos. Os locais escolhidos para recorrido são de muito bom gosto. Sugiro somente a renovação da frota de bicicletas que poderiam apresentar melhores condições. Essa ação tornaria o passeio perfeito. 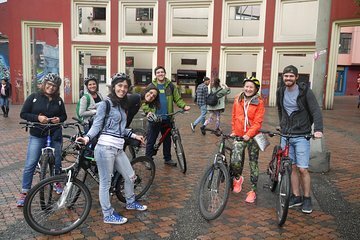 Don’t hesitate to jump onto the morning or afternoon Bogotá bike tour. It’s a truly awesome way to experience and be introduced to a great city and an amazing country. The guides are super friendly, speak great English and will show you a really fun time. Spectacular value too! This is the fun experience you’ve been dreaming about as an intro to Bogotá! Guides and mechanics are great and it’s about a 3/10 for degree of difficulty; not because of hills or length, just because you do need to be alert when riding in ANY city. This tour is for anyone of any level of bike skills. Loved the tour. Take water!! Alot of biking.